Zoom! Zoom! Are your kids learning about space or interested in rocket ships? If so then this simple craft is perfect for them! You just need a few basic craft supplies and you are ready to make this fun and easy craft with your kids. 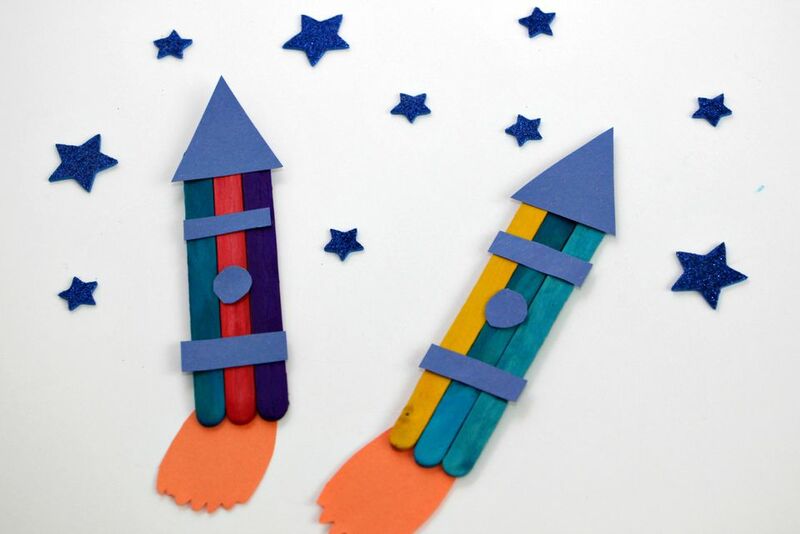 These are a great craft to make with preschoolers when learning about space or even just for a quick and colorful craft. It doesn't take much to set up this craft or to make these, but they look so cute when they are done. Are you ready to make some rocket ships? If you don't have colored craft sticks on hand you can always use plain craft sticks and paint or color them with markers. For this craft we used colored craft sticks that have been in our supply closet forever. Cut one of the craft sticks into small sections, this will be the support that will hold your craft stick rocket ship together. Line three craft sticks next to each other and apply tacky glue across them. Next you want place your cut section of craft stick across the glue and let dry. While your tacky glue dries cut out your rocket ship accents from construction paper. Use whatever colors you want on yours. You will need two rectangles, a circle, and a triangle for each rocket ship. Don't forget to cut out some flames to add to the bottom of your rockets so you can see them blasting off into space! Use your tacky glue to add your rocket ship pieces. Once they are dry you are done! Hang them on your wall as-is or you can even take it a step further and create a whole space scene on some construction paper with them.